Example : The current year and the year in which the employee joined the organization are entered through the keyboard. If the number of years for which the employee has served the organization is greater than 3 then a bonus of Rs. 2500/- is given to the employee. If the years of service are not greater than 3, then the program should do nothing. Observe that here the two statements to be executed on satisfaction of the condition have been enclosed within a pair of braces. If a pair of braces is not used then the C compiler assumes that the programmer wants only the immediately next statement after the if to be executed on satisfaction of the condition. In other words we can say that the default scope of the if statement is the immediately next statement after it. 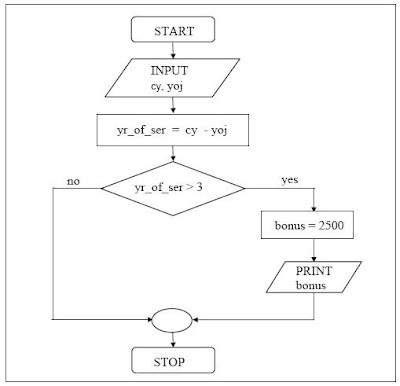 Here is the flow chart of the sequence of above program. The previous post of the blog deals with IF Statement in C programing.